With a large family, motels are always expensive and we always have to get a family suite. Because we are often traveling on a shoestring budget, I have learned which brands are usually good deal and which ones just don't make the cut. 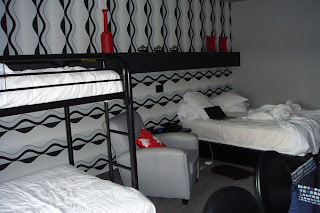 We all like to stay in posh accommodations, but here is my top pick for budget motels (less than $125/night in most cities for a family sized room). Comfort Inn is usually the best bang for the buck. When I am planning a vacation, I always check their website first and use it as a baseline. They usually offer a higher quality breakfast than other discount motels (some even offer eggs, bacon, and sausage) in addition to large selection of carb classics (cereal, toast, bagels, pastries, waffles, muffins, juice, milk, etc). By not having to buy breakfast, especially one that offers protein, I save significantly. I have also always found Comfort Inn to be clean (as far as motels go) with reasonable customer service. Because each one is different, you may find a few bad apples or one that is having an off day (we stayed in one where the swimming pool was too cold to use). But in general we have been very satisfied with quality and price. I also like many of their sister properties, most notably Comfort Suites. I definitely recommend checking yelp.com before booking any motel. After skimming through several reviews, you will know exactly what a motel is like. Also, negotiate the price. Call the motel directly (not a 1-800 number) or watch for internet specials. Most motels will negotiate and you can save a lot (a few will be hostile in which case, hang up, and book online or take your business elsewhere). Some of our best bargains have come when we didn't have a reservation and we started calling around 4 as we continued driving. Some motels were willing to deal and deal big. A water park motel located in Amana, Iowa was grossly under booked when we driving through. We stopped in and were able to get a family suite including water park admission for under $100. I don't expect that to happen again, but it will be great if it does. If you are traveling in the Midwest or Old Northwest or Western Pennsylvania, the number of motels that offer water parks is incredible. So, you might want to call around and see who if offering a deal. There is a risk, however. Sometimes smaller towns will be booked (regional softball tournament, a business retreat, etc). In which case, you may be driving to the next town and not checking in until 10 or 11 at night. That is why I recommend you start calling around 4 so you can generally avoid that problem. You should also book a motel based on why you need one. If you are checking in at 10:00 pm and will be leaving after an early breakfast (which we have done when on a cross country drive), than you just need a basic, clean room preferably with a free breakfast. If you will be spending a good part of the day at the pool (or water park), will be using the room to nap children (you will want fast internet and a decent tv), and want to relax (perhaps at a hot tub, exercise room, or game center), then you need to make your reservations accordingly. Motels are expensive but do not have to be budget breakers. Spend just enough to get the amenities you are looking for, be sure to negotiate the price when you book a room, and don't try to be too cheap--you don't want to end up in a dirty room that ruins your whole vacation. Hey there, pretty good review eh! I've stayed at one comfort suites goodyear az a year ago and from what I've gathered online, it gets fully booked the whole year through. That's something to think about for my next trip.